A special variant of the Cas9 protein forms the core of the processor. In response to input delivered by guide RNA sequences, the CPU regulates the expression of a particular gene, which in turn makes a particular protein. 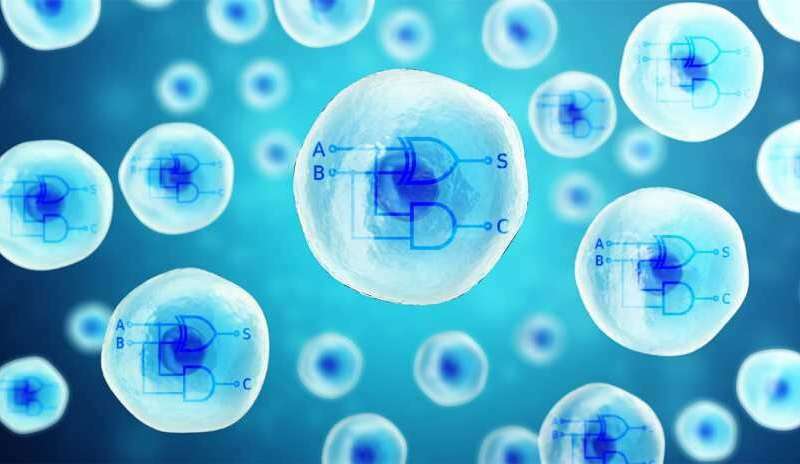 With this approach, researchers can program scalable circuits in human cells – like digital half adders, these consist of two inputs and two outputs and can add two single-digit binary numbers. This biological computer is not only extremely small, but in theory can be scaled up to any conceivable size. "Imagine a microtissue with billions of cells, each equipped with its own dual-core processor. Such 'computational organs' could theoretically attain computing power that far outstrips that of a digital supercomputer – and using just a fraction of the energy," Fussenegger says. "This cell computer may sound like a very revolutionary idea, but that's not the case," Fussenegger emphasises. He continues: "The human body itself is a large computer. Its metabolism has drawn on the computing power of trillions of cells since time immemorial." These cells continually receive information from the outside world or from other cells, process the signals and respond accordingly – whether it be by emitting chemical messengers or triggering metabolic processes. "And in contrast to a technical supercomputer, this large computer needs just a slice of bread for energy," Fussenegger points out.